The Chiffchaff Phylloscopus collybita is an abundant species with an impressive global range that stretches from the West of Europe across Siberia to Russia’s far East, just falling short of reaching the Bering Straits by a laughable 800 kilometres, a fact one individual apparently found too awkward to bear. As its scientific name plainly shows, it is a member of the leaf-warblers, a group of roughly 55 species whose main characteristic is that they are essentially all green or brown above and off-white or yellowish below. This is a rather narrow colour spectrum to share amongst 55+ species, making the Phylloscopus-warblers one of the most notorious of the Old World identification challenges. However, if aspects of beauty, aesthetics and uniqueness are graciously left aside, the Chiffchaff is actually a rather interesting species thanks to its complex taxonomy. Indeed, its taxonomic treatment during the last few years almost rivals the splitting of the ancient “Herring Gull” into more species than you could identify if your life depended on it. The splits within the Chiffchaff complex so far pertain to rather isolated mountain and island forms in the West and South-West of its range: Iberian Chiffchaff (P. brehmii), Mountain Chiffchaff (P. sindianus), and Canary Islands Chiffchaff (P. canariensis). This is all easy stuff because the populations are geographically isolated, and you can analyse their songs and DNA and thus come to more or less convincing conclusions. But easy ain’t all. There’s more. Within the Chiffchaff’s rather coherent continental range from Western Europe to East Asia, we can observe a gradual change in colouration and song. While the central and western European nominate subspecies collybita is generally (on average, and with a good measure of over-confidence) separable from Scandinavian and Eastern European birds of the subspecies abietinus, the latter form gradually changes into the rather distinct East Asian form tristis, or Siberian Chiffchaff. Although this change seems to be gradual, most authorities define the Ural mountains as the border between abietinus and tristis. And here is the problem: Siberian Chiffchaffs are visually distinct, call very differently from European Chiffchaffs and their song is so different that one form doesn’t react to the other’s song in playback experiments. This all sounds good for it to be a “good” species, but we know very little about the contact zone between the forms. Maybe the two song-types are connected by a gradual change? Maybe the same applies to colouration and call? This problem is amplified by the fact that most of what we know – apart from song recordings – comes from vagrant “Sibes” that were caught in Europe. How can we thus be sure that “Siberian” colouration and “Siberian” calls correspond to “Siberian” song? 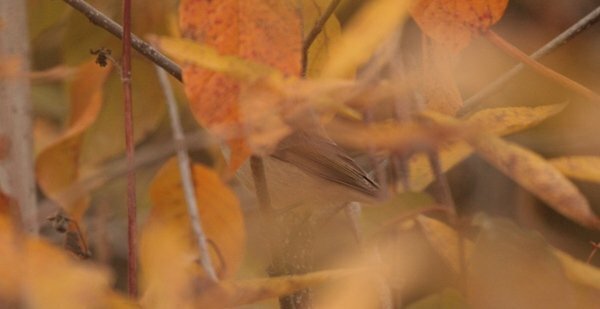 How would we view their taxonomic situation if we found that birds looking like European Chiffchaffs showed a Siberian song on their breeding grounds somewhere along the Ural mountains? 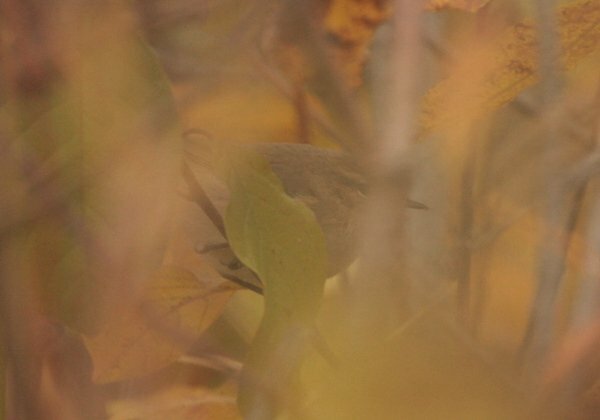 The taxonomic status of tristis is therefore still in limbo, with some authorities treating it as a subspecies of Chiffchaff and others as a separate species. Birders, of course, are always ahead of their time and certainly well ahead of scientific taxonomy, and most will regard Siberian Chiffchaffs as distinct enough to be worth looking for. And worth looking for they certainly are, as Siberian Chiffchaffs turn up regularly but rarely in Europe and are welcome to do so by birders just as much as any genuine, true and taxonomically undisputed Siberian vagrant leaf-warbler. They may not be real, but we love them anyway. Please allow me a moment of quiet reflection. 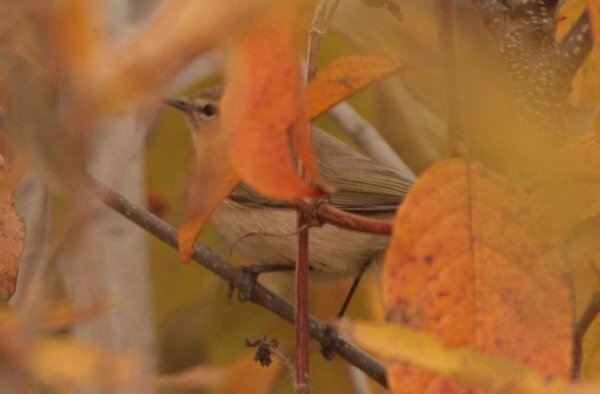 What I actually meant to say with this introduction is that I spent a few very enjoyable days in Kazakhstan’s far East at the end of September, and that one of the birding highlights for me was the chance to see and study Siberian Chiffchaffs at length and repeatedly. 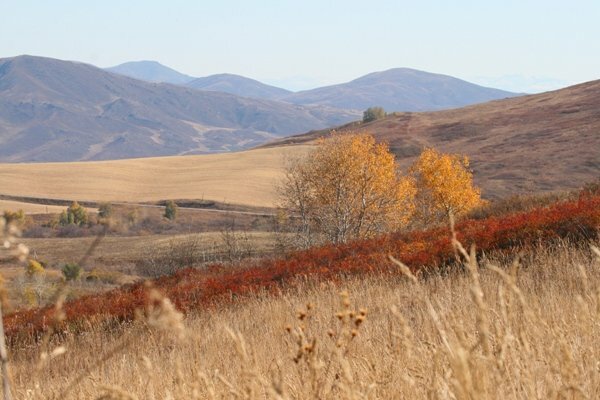 And the foothills of the Altai mountains in Kazakhstan are the prefect setting for watching tristis in autumn, something I trust the following images will convey. The Altai mountains are frequently referred to by some as the most harmonic and peaceful mountain range in the world, while others maintain that this is absolutely the case. 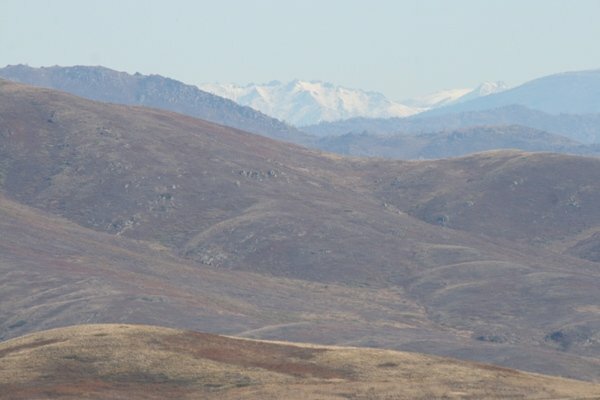 By the end of September, the higher mountain ranges are already covered in snow. Sadly, this did not convince the Altai Snowcocks from venturing as far down as the foothills which I was frequenting, but I guess you can’t always have everything in life – just sometimes. This little creek was located a short walk away from my accommodation, and I visited the area and its birds a few times during my trip. 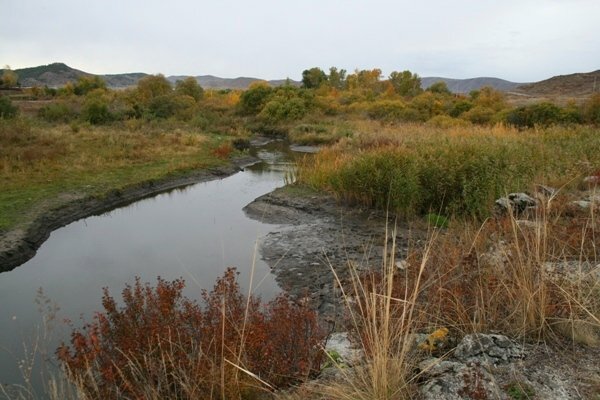 This may look like a nice birding place from where you are sitting, but if the only way to bird it is to bird straight through it, the dense vegetation will influence your perception of the place. And the presence of Giant Hogweed will as well. 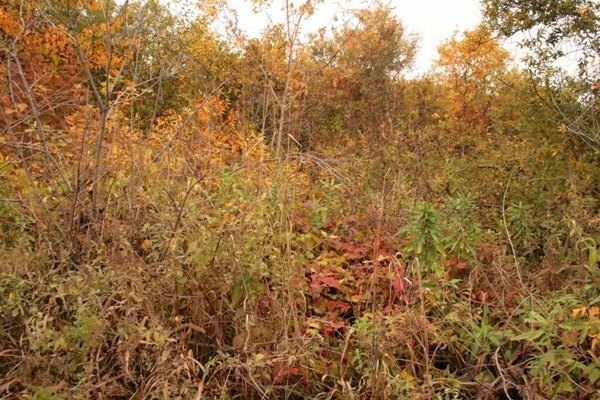 Once within the thicket, the autumn colours of the leaves were beyond a human’s comprehension, and while the foliage cunningly prevented me from ever getting a clear picture or even view of the many Siberian Chiffchaffs within, they allowed for a series of rather … well … artistic scenes I captured which contain Siberian Chiffies, as shown below. And yes, I also walked straight through that picture after taking it. Just been watching one of these found by a good friend on our local patch this morning. 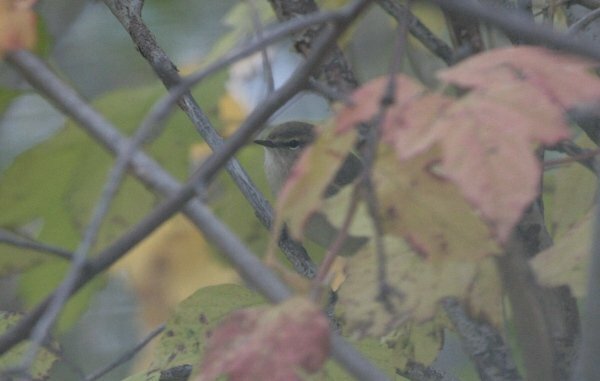 I’ve got an image side by side with a Common Chiffchaff that is quite illuminating, (will be posted on blog soon)they are very different! Can you be a little more specific about where you were? This area is on my list of places I’d love to visit. and I’m always on the lookout for more information. Thanks! @Alan: what a coincidence, that is amazing! Looking forward to the pics, and yes: my guess is that they are a different species and will eventually be split once the science has been gathered. @Steven: thanks! You have some amazing photographs on your blog, remarkable! @Carolyn: I was in the Kazakhstan part of the Altai near a small industrial village called Bukhtarma (this was a business trip and no one would go there for anything else but business, which is why I didn’t mention the site). The Altai in Kaz can be reached by flying from Astana to Ust Kamenogorsk, easy to do. From there, take a car (well, hire car and driver) and about an hour later you are in the mountains. Apparently, the settlement of Ridder is a good starting point for trips into the Altai mountains propper, not just the steppe-dominated foothills I ventured through. Cheers! Kaz is worth a dozen trips. @Carolyn: an alternative name for Ust Kamenogorsk is Öskemen, in case you can’t find the former.